The fight starts now to make sure the 2014 Boston Marathon isn’t a nightmare for civil liberties. If emerging victorious after being down 3-0 to the Yankees in the 2004 playoffs should have taught us anything, it’s that the people of Boston are tough as hell and never lose faith. After Monday’s bombing of the Boston Marathon and the following days under lockdown, we are already seeing that resilience emerge. Already, people in the city are talking about how the Marathon next year is going to be bigger and better than ever. Already runners are signing up in droves. Already according to one website, the race in 2014 could have “15 to 20 times” the number of people attempting to qualify. 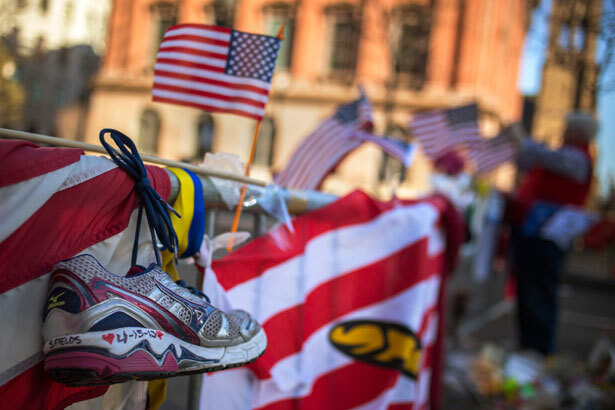 As Raymond Britt, a Marathon analyst who ran the 26.2 mile course for thirteen consecutive years said, “We believe it’s an extraordinary sign of the running community’s desire to support Boston. They want to come to Boston in 2014 to defend her honor, take our race back from evil, to prove the spirit of freedom will prevail over all.” Bloomberg News also ran a story about the commitment of runners to retake Heartbreak Hill in 2014. I in no way doubt that next year will be a celebration of the city’s stouthearted fortitude. I have no doubt that people will arrive in droves to witness “the spirit of freedom prevail.” But I do think we need to separate the bravery of those who will gather in 2014, and what the security imperatives will undoubtedly be. We need to critically examine what’s proposed and, if necessary, raise our voices in protest. There are undoubtedly many people that will accept this trade-off. The Boston Marathon must be run, and if it needs to happen under military watch, then so be it. This argument is easy, but it’s a grave mistake, and it’s why we need to protect the 2014 race from ourselves. Instead of blank-faced compliance, we should take immediate steps. This means building movements now for citizen oversight on the security operations for 2014. This means building movements now against the militarization of the police force. This means building movements now against Islamophobia and the harassment of black and brown youth (and yes, we should appreciate the awful irony that criminal actions of two white guys will spur state harassment of people of color). By taking this approach we can do more that preserve our civil liberties. We can also preserve as much as possible of what is so communitarian and precious about the race itself. The Boston Marathon is the most open mass-sporting event on earth with 500,000 people gathering in eight different cities. Maybe it will never be the wide-open, innocent party of years past again. But in honor of those determined to gather, run and not live in fear, we shouldn’t easily surrender what made the Boston Marathon—not to mention our civil rights—so mighty in the first place. Read Aura Bogado’s interview with author Sohail Daulatzai on communities of color and the response to Boston.